With an international touring schedule and a succession of releases, Alesso continues to build his international profile. He enjoyed a good 2012 which saw him ranked at #20 in the DJ Magazine’s Top 100 as well as the success of hits 'Years', 'Clash' and 'Calling' with Sebastian Ingrosso featuring Ryan Tedder. The latter peaked at No.1 in the US Billboard dance chart as well as being voted as 2012's Hottest Record in the World by BBC Radio 1's Zane Lowe. 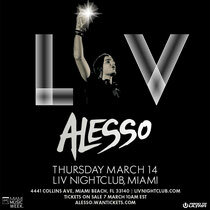 Fresh from the news that he recently won a 'Grammis' (the Swedish version of a 'Grammy') for 'Innovator of the Year' with Sebastian Ingrosso, Alesso recently announced his show at LIV on Miami's South Beach on March 14. 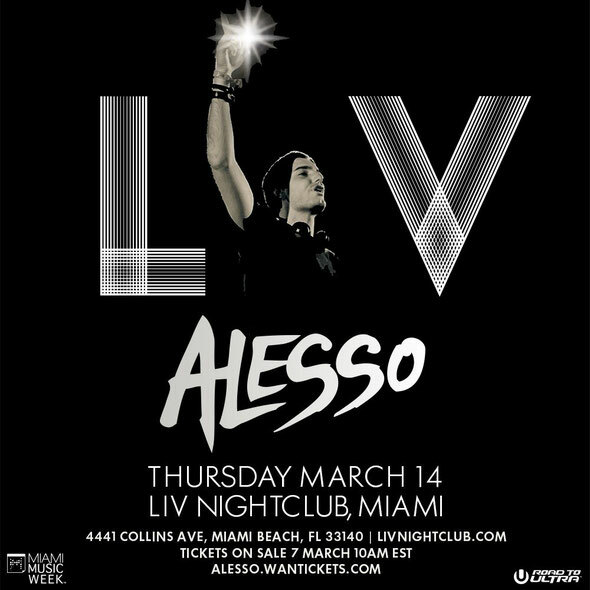 The show kicks off a whole host of MMW shows for Alesso, where he will perform a special set on the Mega Structure stage at The Ultra Music Festival on Sunday March 17 and then returns to take on the main stage on Sunday March 24. This summer also finds him playing at festivals such as Tomorrowland in Belgium, Creamfields in the UK and Summerburst in Stockholm and Gothenburg to name a few. Look out for him in the UK on March 30 and 31 to play The Arches in Glasgow and The Warehouse Project in Manchester.